I guess I’ve been in a rut and am ready for a little shake up in the A.M. When I saw Swedish Pancakes “Pannkakor” in the June Food & Wine, I just had to go for it! 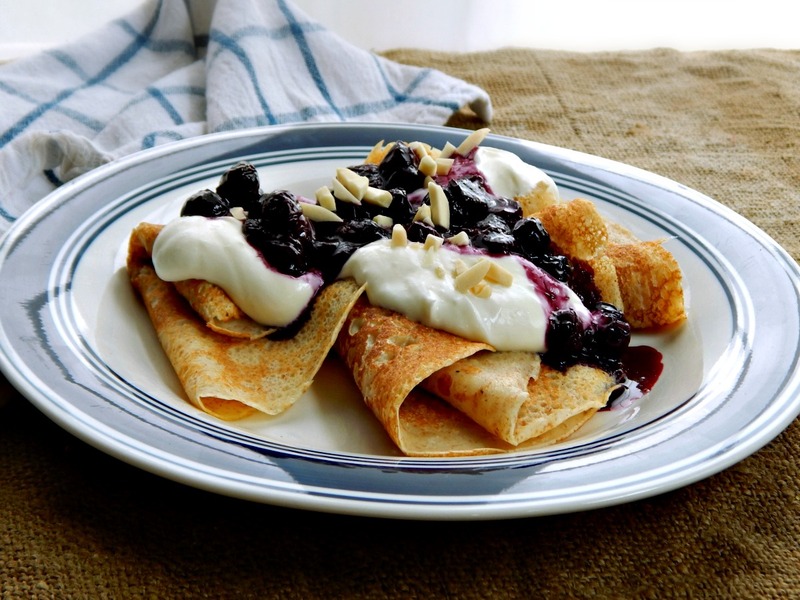 So now, we have the delicate crepe-like pancakes, drizzled with a tart blueberry compote. Why stop there? Go big or go home! While Food & Wine recommended clotted cream (rarely available) or creme fraiche (pricey) or whipping cream (just too light) I decided to make something along the lines of my Mock Mascarpone. A few sprinkles of almonds add just the right finishing touch. These Swedish Pancakes are pretty low sugar and made with a combo of whole and white wheat, but they do use cream. I decided to sub a low-fat buttermilk instead of the whole milk just to tone them down a bit. I kept the cream; after all, I was using it in the topping. These Swedish Pancakes are fabulous. I highly recommend you make them as soon as you can! In a medium saucepan, combine the berries with the orange juice & cook over moderate heat several minutes, stirring occasionally until the berries have softened and several have burst giving off their juices. Set aside. This will thicken a bit as it cools, and you’ll want to serve at room temperature or only slightly warm. If it seems too thick, add a touch more orange juice. Place cream cheese in a bowl and with an electric mixer, beat until smooth and fluffy. Gradually add the cream, beating, and then continue to beat until whipped and fluffy. Add powdered sugar to taste and set aside. Preheat oven to 200° F. Line a baking sheet with parchment paper. In a medium bowl, whisk the flour and salt. In a larger bowl, whisk the milk and cream with the eggs until smooth. Gradually whisk the flour mixture into the milk mixture until fully incorporated; the batter will be very thin. Heat an eight inch cast-iron skillet over moderate heat. Using a pastry brush, add about 1/2 tablespoon of butter and swirl it around. Add 1/3 cup batter and swirl the skillet to bring the batter to the sides of the skillet and distribute the batter evenly. Cook until bubbles appear and the top looks dry, 2 to 3 minutes. Flip and cook until the pancake is lightly browned on the bottom, about a minute. Transfer to the prepared baking sheet and keep warm in the oven. Repeat with the remaining batter, adding a thin coating of butter to the skillet before adding the batter. To serve, fold each pancake in half, then in half again to form a triangle. Top with the topping, compote and toasted almonds. This will make about nine or ten small crepe like pancakes. With the topping and compote, they’ll be pretty filling, but if serving four adults, you’ll want to have sides. The pancakes can be wrapped in plastic and refrigerated for up to 3 days; reheat in the microwave. I’ll be taking this to Fiesta Friday this week, hosted by are Jhuls @ The Not So Creative Cook and Su @ Su’s Healthy Living. This entry was posted in Click here for Bargain Meals, Click here for Fabulous Food Posts and tagged Blueberries, blueberry compote, Breakfast or Brunch Dish, Buttermilk, Cream, Crepes, Food & Wine, Freezes Well, Frugal Hausfrau, milk, orange juice, pancakes, Pannkakor, Swedish, Swedish Pancakes. Bookmark the permalink. Thanks Rhonda, and I appreciate the comment! I’m glad you guys liked them! OO these look amazing! bit of a change from the usual american pancakes we seem to get all the time in York! So often I eat the same old things for breakfast so these really hit the spot! Thanks! Thanks so much Rhonda! Your comments always make my day. I bet they’re really soft and creamy with that rice flour….I’ll have to look into it! I don’t know Mollie– yours looked like they couldn’t be improved upon! I’m looking for wan occasion to make them. hugs! Me, too, I want more and more brunch. All the time. We had a pancake night just the other day. But not Swedish! Now we have to have another pancake night. And this time, Swedish! And maybe go to Ikea for the lingonberry sauce?! Good Mprning, Angie. Ikea’s a great idea. I have to stay away from that place. First of all, I always want the Swedish Meatballs, lol! Then there’s a zillion things I want and everything seems so reasonable, lol! I am sorry to hear that your home was broken into. I can only imagine how upset you must be!! It is not only a personal violation it makes one feel insecure in their own home! Hi Su, I bet your kids would love this – and with the cream, lol! They were seriously good plain. You are so right, it is the violation that makes it so bad. That and taking little personal things that didn’t have much value to anyone else. But in the end, it’s only things. No one was home, no one was hurt. That looks like heaven on a plate! I love the sound of your mock mascarpone with these Swedish pancakes. I love brunches, too, but I really don’t mind having these anytime of the day. 😀 Thank you for sharing, Mollie. I wish you are enjoying the FF party and your weekend! Thank you, Jhuls. 🙂 I love that mix of a little cream cheese and whipping cream – it just makes things seem a little more special. Happy FF! Love the compote with orange juice. Brilliant! And we just so happened to put crepes on our meal plan for this week. Great minds!! Hi Christina! I think you’re right, lol. The whole wheat in these was kind of fun. I thought they were just a bit crispier than your average crepe. Yummy! That cream could be my demise….but so delicious. See, a girl after my own heart! The best part. Delicious Mollie – a great contribution to Fiesta Friday! I’ve been a little lapse recently and haven’t managed to tie in my post timing with the weekly gathering – you reminded me for next week! Hi Laura – talk about a lapse! Sorry to reply so late! 🙂 Did I tell you I lost my freezer? My house was broken into and they took everything out and took the freezer…I have no words. OMG … I hate people sometimes. Was this recently? I had someone break in through the kitchen door about 10 yrs ago. Probably looking for quick cash for drugs as the neighbourhood is a bit sketchy. Just grabbed my purse with all ID including my passport, Canadian citizenship papers, wallet etc. I was sleeping upstairs. Took me ages to replace everything. I think they’re wonderful with the cream – helps take away from all that healthier whole wheat, lol!